…“Let us run with endurance the race that is set before us”. I started running to stay in shape in 1982 and since was living in NYC, entered the NYC Marathon with some friends. My parents and brother had run it and encouraged me to train for it. I finished easily and was hooked. Running is part of my lifestyle now, and I run for the energy , weight control, emotional satisfaction, social reasons and feelings of well being. I love seeing new areas to hik and to run and love to combine traveling with running. It helps me concentrate at work, and it is so easy. I am retired from serious competition but hope to keep running. If I can't run ultras anymore, will stick to 5Ks, and if I can't run will swim or bike. Running gives one a sense of community. FI have a few great memories. One memory is from the 1992 Shamrock Marathon. I felt great the whole way, having trained to break 3 hrs, and at mil 20 tried my hardest to keep up a 7 min pace but couldn't do it but in the last mile I was happy anyway and finished in 3:00:29 and was relieved. . I LOVE to help other runners achieve their goals and love to talk to them as we go along and share stories. It is a way to give back to the running community. I know that many runners do better if encouraged along the way when things start getting tough.. I have paced overnight at many Ultras. My best memory is of pacing my best running friend at his first VT 100 (2006) He had pushed very hard for the first 70 miles and couldn’t run anymore. It took us over 10 hours to finish the last 50K but I had no doubts he would do it we started off slowly into the black woods at 9 p.m. and went aid station to aid station at mile 80 he fell asleep standing up and wanted to lie down on the side of the road and sleep. I had to convince him to keep going to the next aid station where he could drink coffee. He also had painful blisters and quads and battled discomfort and pain the whole way. He thought we were going to miss the cut off at mile 95 and literally took off running the mind is stronger than the body sometimes. When we crossed the finish line in 28 hours, I was very proud of him and vowed that I would run the race myself. I am a very experienced runner and have a consistent pace I rarely go out oo fast or finish to slowly. My pace is usually the same for the first half and the second half of the race. I am friendly and easy to run with won’t talk unless you talk to me! I know how to maintain a certain pace from start to finish. 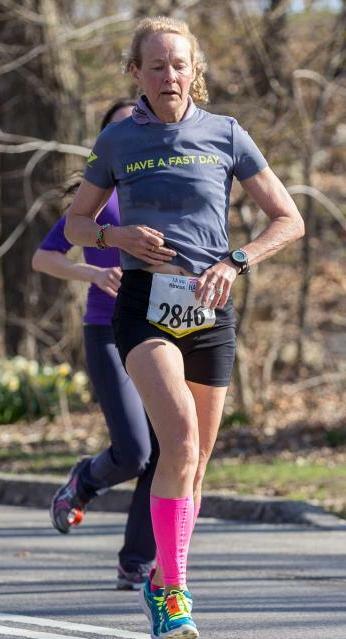 I would say to try and do what I do to have a successful race taper down and rest the week before; get plenty of sleep and good foods, and view the race as another long training run same clothes and shoes, and same positive attitude. SOMETHING will go/could go wrong but if you have trained you will finish. my role as encouraging new marathoners and new ultra runners.. I am the Volunteer race director of 2 races. Have directed for 5 years (2013 will be my 6th year) the Taconic Road Runners Club July 4 Putnam County Classic 8 miler (www.runner.org). Nov. 2013 will be my third year directing the Greenwich Alliance for Education Turkey Trot 5K and 1 mile run (www.greenwichalliance.org!). I have also been on the committee for a Mother’s Day Kid’s bike ride for 8 years, and serve on the board of Greenwich Safe Cycling. I volunteered for years at my children’s’ schools but now volunteer on an as needed basis.